Taking it all in their stride, Bob and Cara take some time out on the Blackwater way, above. WALKING enthusiasts are not a rare sight along the Blackwater Way but with a dog and a goat along as travelling companions they certainly raised an eyebrow or two. 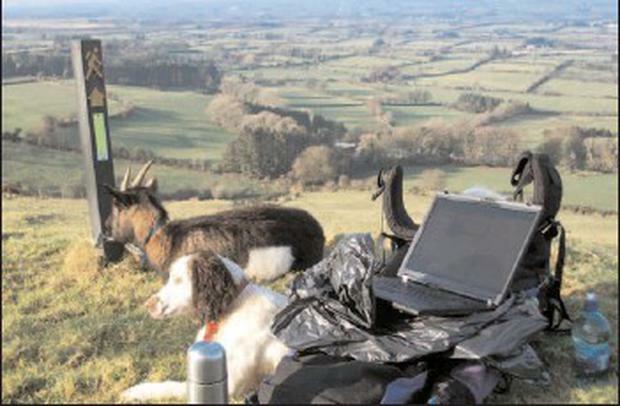 Kerryman Nathan Kingerlee (27) had just finished reading 'Round Ireland With A Fridge' by Tony Hawks when the thought struck him, in the pub, that he would love to walk the Blackwater Way but instead of a fridge he brought along Bob, his goat, and Cara, a springer spaniel. For Nathan it was a social experiment to see if the famous Irish welcome still exists. The Corkman caught up with Nathan after he wound up his five day trip and declared that the Irish welcome was 110% alive and well. "Any traveller will certainly find the Irish welcome — but you have to go off the beaten track," Nathan reported. "I met so many people when out walking and just by stopping and talking to people, there was unbelievable fun to be had." Nathan is well used to the outdoor life as he runs 'Outdoor Ireland', an adventure company based in Killarney. When Nathan started off on his experiment a week ago his first encounter was with a farmer, Dan Joe from Millstreet, who had heard about Nathan's 168km walk, and brought him and, of course, Bob and Cara to his house for tea. The Blackwater way is a marked trail, stretching from Shrone near Killarney to Clogheen near Clonmel in County Tipperary. Along the way it meanders down the lush Blackwater Valley and weaves through the Bogeragh and Knockmealdown Mountains. It's one of 31 national way-marked trails, such as the Kerry Way and Wicklow Way. By last Friday morning Nathan had made it to Kilworth, where he admitted that he was "lost in the woods". However, during the week he said that he encountered "fantastic hospitality" at the Nano Nagle centre in Killavullen. "The nuns gave me the best cup of tea and the nicest brown bread ever. And they certainly looked after Bob and Cara for the night. I'd mighty craic with the nuns, they were great fun," said a very bubbly Nathan. He, along with his two trusted companions, walked approximately 30km per day. Nathan said that Bob walked directly behind him when they had to take to the road. This prompted a number of passing drivers to stop and remark: 'do you realise there is a goat walking behind you', before inquiring why was a Kerryman walking with a goat and a dog in the Rebel county. "I certainly get a lot of salutes when I walked on the road and more than one strange look," said Nathan. Each night Nathan had organised a B&B and he said all had sheds out the back of their premises for Bob and Cara. And what about the odd fight between Bob and Cara? "Well at the beginning they were jostling for position and were both looking at each other with suspicion, but within a few miles into the journey they were happy out," he said. On one of the last days of his hike he was in Araglin, near Kilworth, and when walking across a field he met two farmers who were helping a cow to calve. When the calf was born and checked over, Bob and Cara were put into the back of the farmer's horsebox and driven to their farmyard, where he was treated to fresh homemade apple tarts and fruit cakes and mugs of tea for over an hour. That night he stayed in Hickey's B&B where chickens, ducks and peacocks ran around the yard. "Bob and Cara were happy out in a shed out the back and now they get on famously," said Nathan. With a laugh, he said he now plans to walk from Killarney to Dublin and hopes to end up having a cup of tea with President Mary McAleese in Áras an Uachtaráin.